Are you planning to remodel your living space? Well, if you are, imagine being able to create a seamless merging of the indoor to outdoor areas. Folding glass walls offer the ideal solution for opening, and connecting the interiors of your home to the great outdoors beyond. Today’s technology makes sliding and folding designs more creative, as well as being energy efficient and weather resistant too. These stunning glass wall designs are the perfect catalysts for opening an interior space to an outdoor living area, with a natural flow between a living room and deck. Keep the view open and unobstructed when planning a free flow between indoor and outdoor space. Your reward will be a natural flow from inside your home to outdoors. The effect can be stunning. 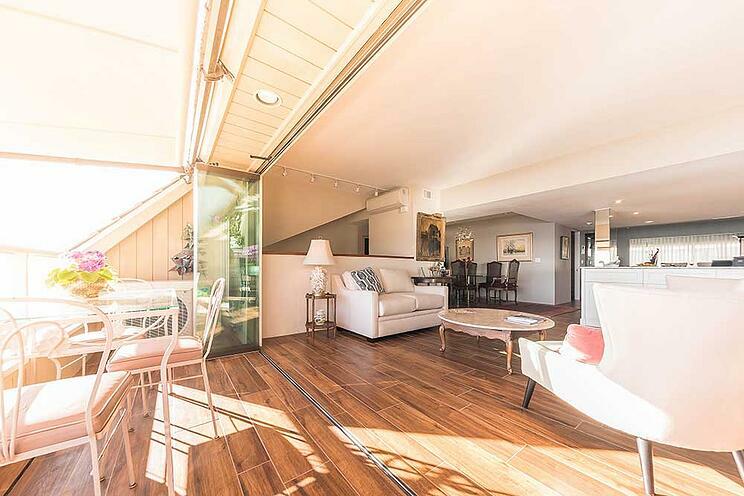 Seamlessly connecting the indoor living space to the outdoor fun zone is possible for just about any room in your home. Think out of the box and don’t limit your ambition to your lounge area. Ever-greater options are at our disposal to merge indoor and outdoor living, making this a rapidly expanding trend in the remodeling sector. Homeowners are relying more on doors and windows to move away from traditional solid divisions between indoor and outdoor living. The popular choice now is to transform patios into extended living rooms. Greater options for patio doors and moving glass wall systems provide homeowners with several choices. Pocket glass walls help transform an interior space into an open-air retreat. With the glass panels fully open, they slide into the wall pocket and disappear from sight. Once fully closed, the large panels serve as a frame for the scenic views on offer, making an attractive asset to homeowners. Clever stainless steel rollers render the large panels easy to operate, even with heavier panels. The use of thermally broken aluminum with a full weather-stripped structural interlock system helps improve energy efficiency. Stacking glass walls open with the assistance of sliding large glass panels on top of each other. This allows natural light and free ventilation to flood the living space. 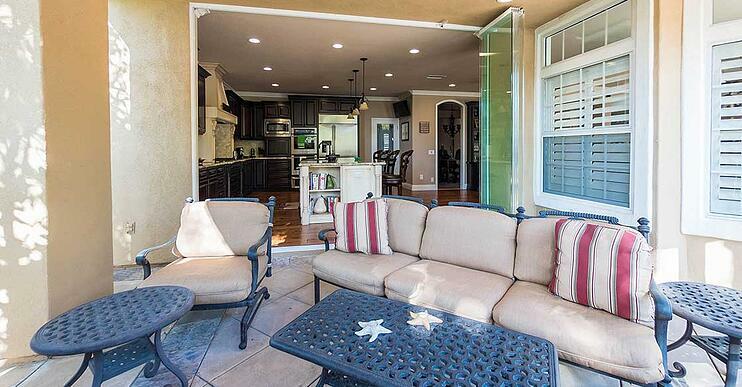 With the glass doors open, your patio becomes an extension of your living room. The popularity of using wood in design schemes for indoor/outdoor living areas opens fresh opportunity. An aluminum-clad wood option with a solid wood interior blends seamlessly and enhances the natural surroundings. Bi-fold glass walls operate seamlessly with each panel folding on top of the adjacent panel to open. Designed to smoothly stack and fold against sidewalls, they create a cavernous opening from corner to corner. Consider adding convenient swing doors to allow easy, everyday access. Other upgrade options include a flush floor sill, for a smooth transition from inside to the outdoors. Uninterrupted views are what greets the eye, but that is not all. Opening a wall to your property adds considerable value by optimizing your open floor plan, adding to your livable space. The use of tempered glass protects you and your loved ones from flying objects, but the lamination also works as a sound barrier that will greatly reduce noise entering your living space when closed. It is great to know that glass wall systems offer natural ventilation in your living space. This is because each glass panel slides individually, and the user has the ability to open one or a few panels to create gaps within their system for natural airflow. Yours to Choose! Once you have chosen your preferred glass wall, consider additional elements many homeowners find appealing. For example, a retractable screen that rolls into a pocket and virtually disappears when not in use, or glass glazing which reduces the need for long, heavy drapes and helps maintain an even climate. The good news is that new ideas and accessories are arriving constantly, and they all add value to our lifestyle. Ready to Make the Most out of your Living Space?